So what is it all about and what does it mean to you? In a nutshell, it is about creating places that people love. By developing connected places which encourage people to walk, use local services and even get to know one another better, there are a whole range of benefits for the individuals and businesses involved. When it comes right down to it, new urbanism is simply about giving people better places to live, work and play - the best quality of life possible. Both walkability and connectivity are simple but key principles in new urbanist communities. This is why at Jindee, the streets are designed to be slow speed and are lined with trees, while garages and carparks are hidden at the rear of buildings - this is all to encourage people to just get out and walk places. At Jindee, even the trees have been carefully selected with pedestrians in mind, with Tipuana Tipus, Figs and other species chosen to provide real shade. So people start walking more.. so what? Streets become less congested with cars, people are exercising regularly and improving their health and neighbours are seeing one another, chatting and visiting local businesses. Something so simple can have a big impact in terms of creating a higher quality of life and building a friendly community where people want to live. It is also about diversity and vibrancy. A mix of different homes, offices and businesses and something to suit a range of people leads to a more interesting, inclusive place where everyone feels at home. 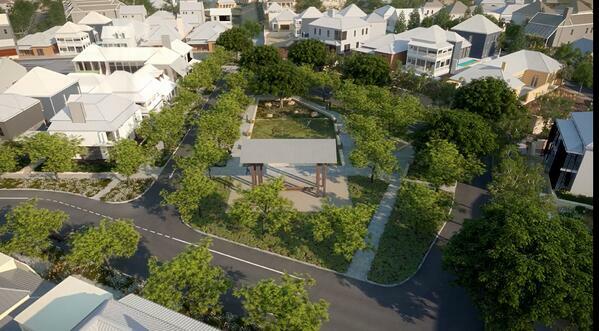 Think about places like Cottesloe and Fremantle, with so much variety all within walking distance of people's homes. Jindee has also been planned to have everything you need within easy reach, including schools, cafes, shops, parks, public trasnport and, of course, the beach! Transect planning is another characteristic and one that you will find at the Jindee estate. This is a more complex idea but basically it is about incorporating mixed use spaces into a single community, with the greatest density of housing as well as parks and shared spaces at the centre. This central area is ideally situated within walking distance form any point within the community. This starts to gradually decrease as you move away from the centre. Jindee is a great example of these principles, with a strong focus from the very beginning on creating a sense of community closeness and a shift away from sprawling developments. Parks and public spaces located centrally, streets designed for walking, garages located at the rear of houses and essential services within walking distance are just some of the things that will make our new community a great place to live. Find out more here.